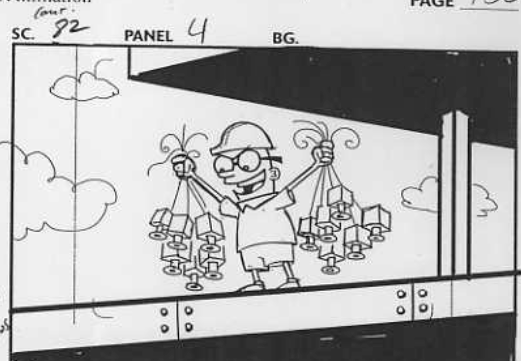 Here are screen grabs from some of the Phineas & Ferb storyboards I did while I was at Disney. If you are here because you are considering hiring me for a storyboard assignment, please email me at berniepetterson@gmail.com I can link you to my Box account, where small parts of these big files can be downloaded and seen in context, so that you can see an example of the kind of work that I do. Sorry Phineas & Ferb fans. My offer of selected storyboard downloads does NOT apply to you. The Walt Disney company employs tens of thousands of REALLY SCARY lawyers. The kind of lawyers who eat guys like me for breakfast. If one of these rough storyboards got loose on the internet, they'd kick down my door and drag me away to a terrible awful place. I really don't want that to happen so, please don't even ask me.